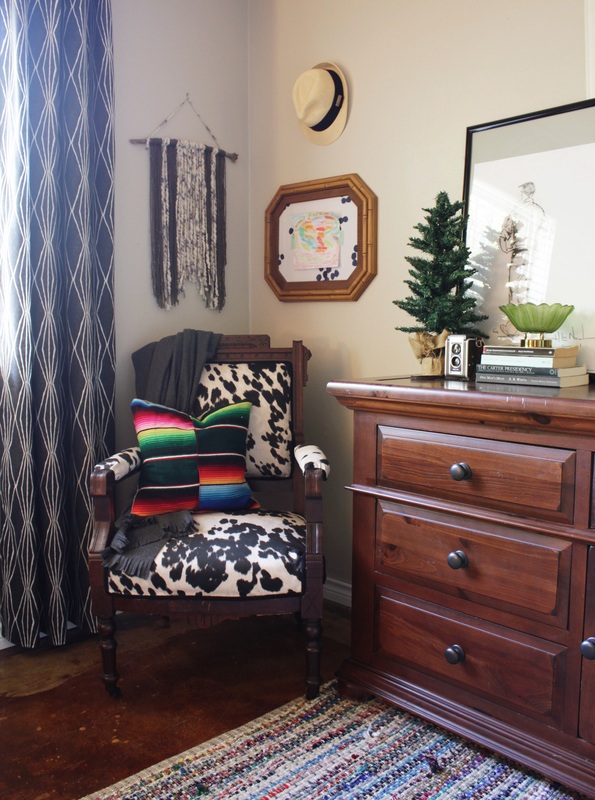 Hello fabric.com blog readers, I'm Jessica Nickerson, a wife and stay at home mom with a love of interior styling. I have a blog called House Homemade and also try to deliver daily home inspirations on Instagram @househomemade. 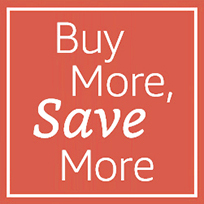 My main goal is to share ways of having a polished, put together home on a small budget. I thrift, re-purpose and makeover anything that stands still for too long. For real, ask my family. 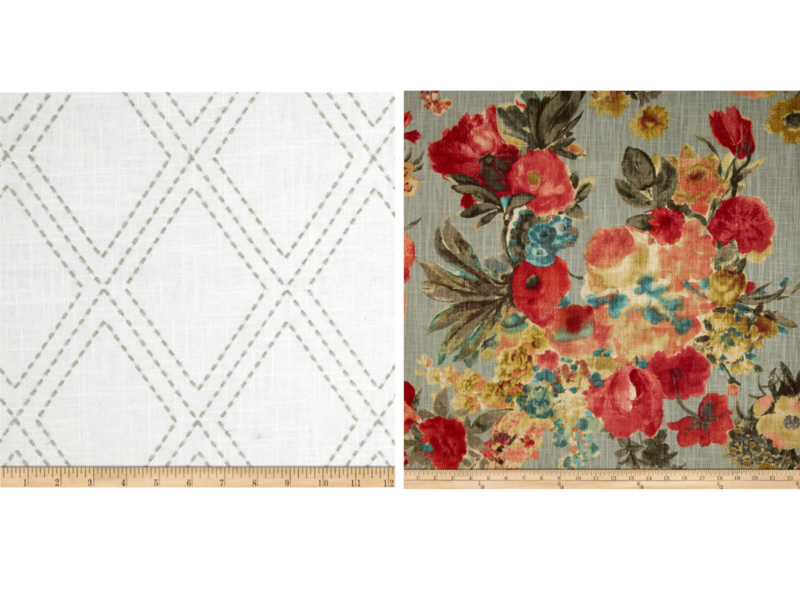 I recently used a combo of fabric.com's home decor fabrics to change up our master bedroom. Here is the "before". It was totally fine but I'm on a color, contrast and pattern kick so the after makes me so happy! I've used fabric.com many-a-time in my own designs so I'm so honored they asked me to guest blog for them today. I hope I can help you make the task of fabric mixing and matching feel a little less overwhelming . 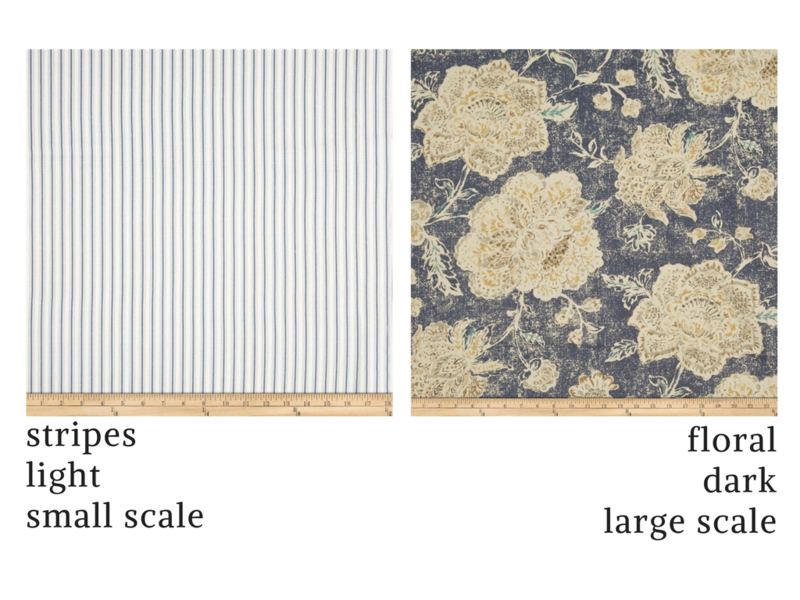 When choosing fabrics, I look at scale, color and pattern. I'll try to break down these tips into 3 categories but really they are related and each works with the other to create a good pairing so let me try to explain. Checking how big or small a pattern is online can be a little bit trickier than when you're seeing it at the store but look at the bottom of this amazing fabric. See the ruler? 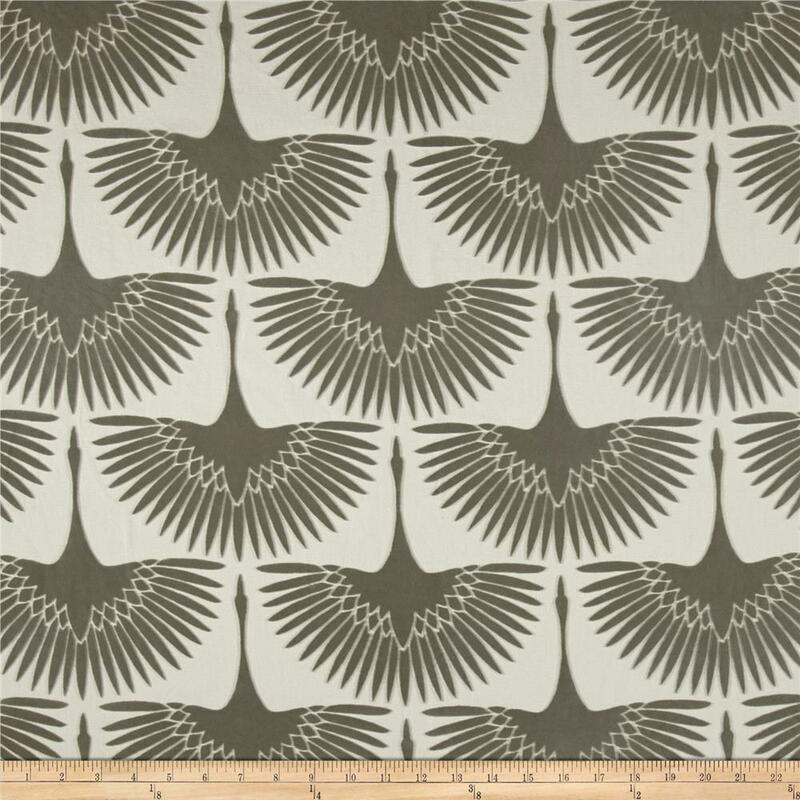 It shows you that on this fabric, each bird’s wingspan is 8" wide. Sometimes I get out a ruler so that I can see just how big that will end up being. This can better help you to visualize the fabric in a space. It also can help determine uses for a certain pattern. 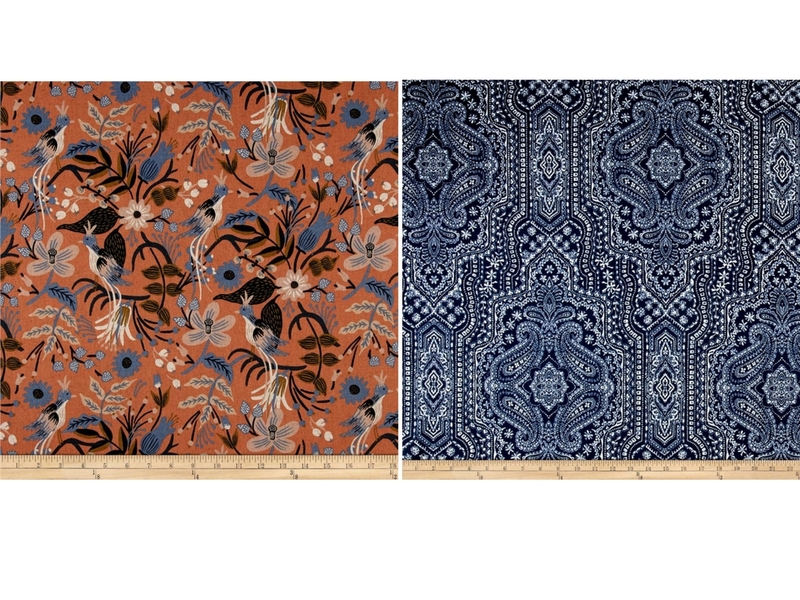 You might not want something this bold to be the curtain pattern for 4 windows in a room, so you might decide to do use this fabric for a few throw pillows and something more subdued for the curtains. OR you might be awesome and bold and rock this fabric all over those windows and if that's the case, please invite me over to see them and hug them. When I'm shopping for multiple fabrics I try to mix and match patterns that complement each other and not usually ones that are in the same family. For example, something geometric with stripes or hard angles works really well with something floral or more organic looking. A print that looks hand-drawn usually looks better with something more structured. I always try to pick something that comes across as more of a solid color paired with something more colorful when using multiple fabrics. You can see in each of my pairings (there are more at the end of this post), one simpler, less colorful fabric and another more bold. It lets them both shine without competing for attention. One fabric is usually more neutral than the other. In the pairing below, I marked some examples of why these would work well together in a space. The striped fabric is so small scale that from afar it almost reads like a solid, working well with the bold floral fabric but letting shine. The fabric I chose for our bedroom is pretty eclectic. To me eclectic means, if you like it, choose it. I paired the vintage diamond geometric pattern with the organic, natural look of the cow print. They’re in the same color family but the diamonds act a little more as the neutral to balance the two out. The next two fabrics are a little more straight-forward than my pick. 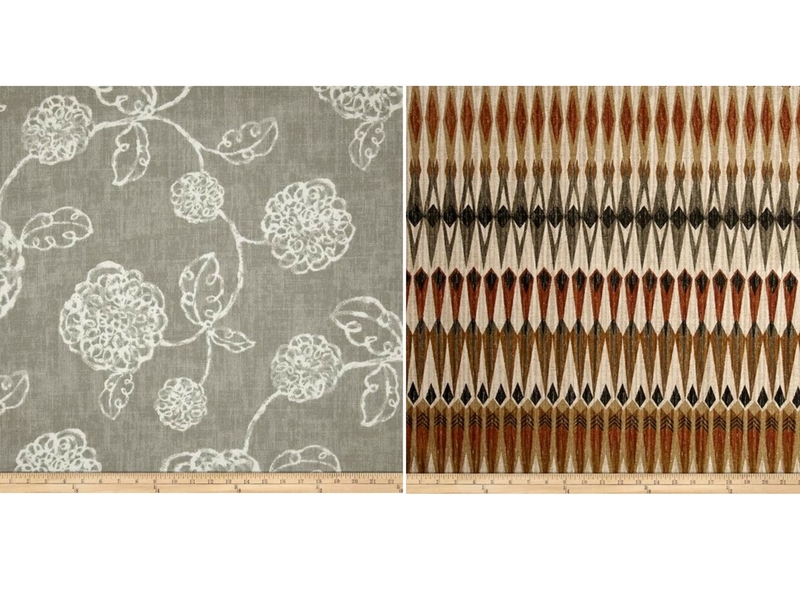 The smaller scale, neutral diamond pattern works so well with the big, bold, colorful floral. The next one is a modern take on a throwback. The glam looking banana leaf is back in style and I love it with the tribal looking geometric. 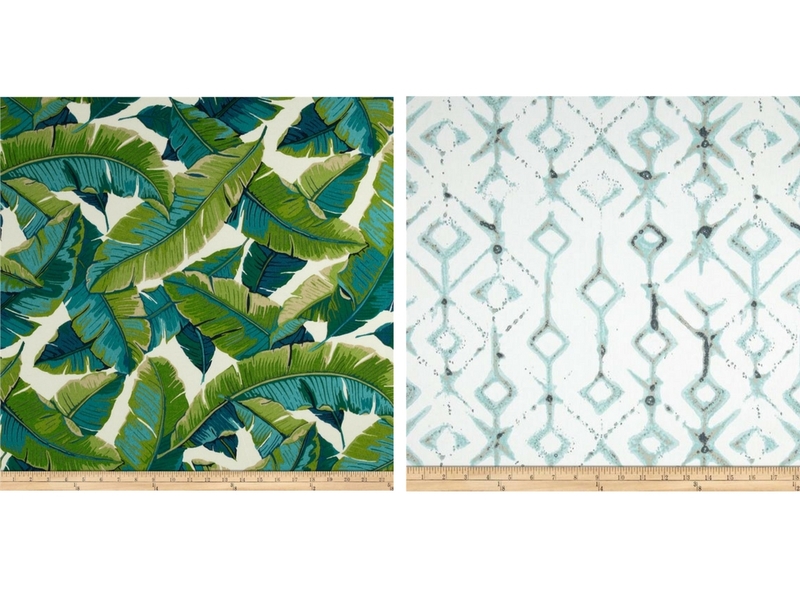 I feel like it would be an obvious choice to pull out the green in the leaf fabric so I love that the other, lighter fabric pulls out the less prominent aqua. Turquoise? Aqua? I was an art teacher. I should know the difference. Anyway, that's a tip in itself. When picking accent colors, go for the less obvious choice, it will make you look like more of a mixing wizard. This next pair is one of my favorites. There is really not much indigo blue in our house but it's such a timeless pick and I love this pattern on this fabric. 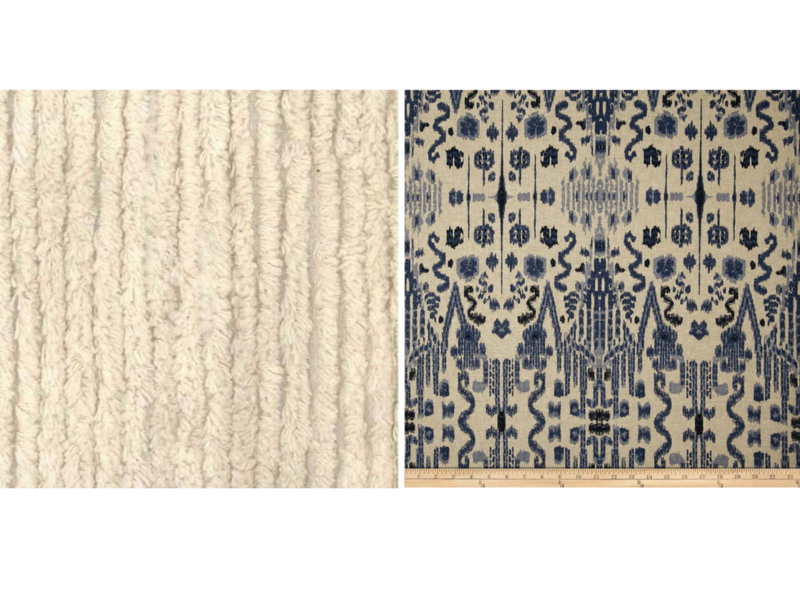 Paired with the striped, textured chenille is so dreamy and it's a great balance to the darkness that the blue fabric could bring to a room. This next pairing, I realize might not be everyone's cup of tea but if I had some extra funds and an extra room laying around, I'd love to design a space around this pairing. I love the floral, rust colored fabric. It's so vintage looking and cool. It’s toned down a bit with the almost monochromatic navy fabric but I still love its bold pattern too. 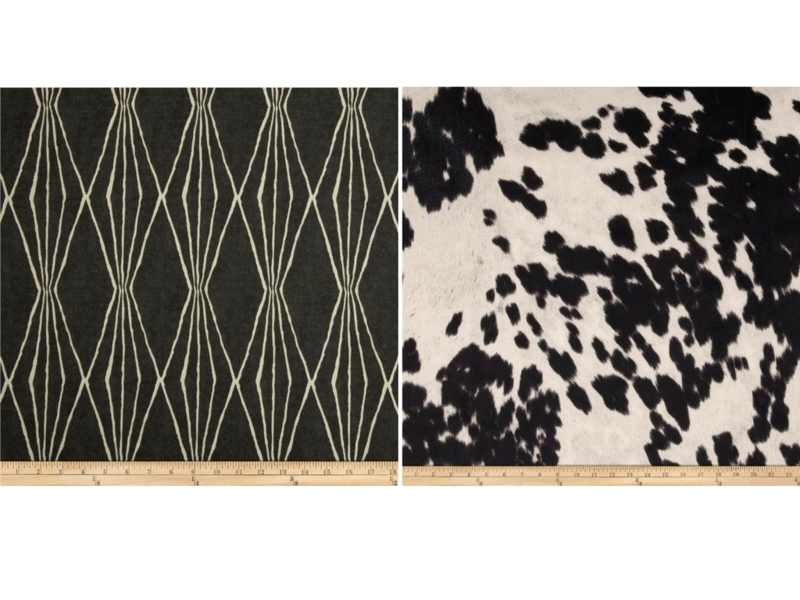 This next pair might lack color but I love the prints on each and black and white can work so well in so many spaces. 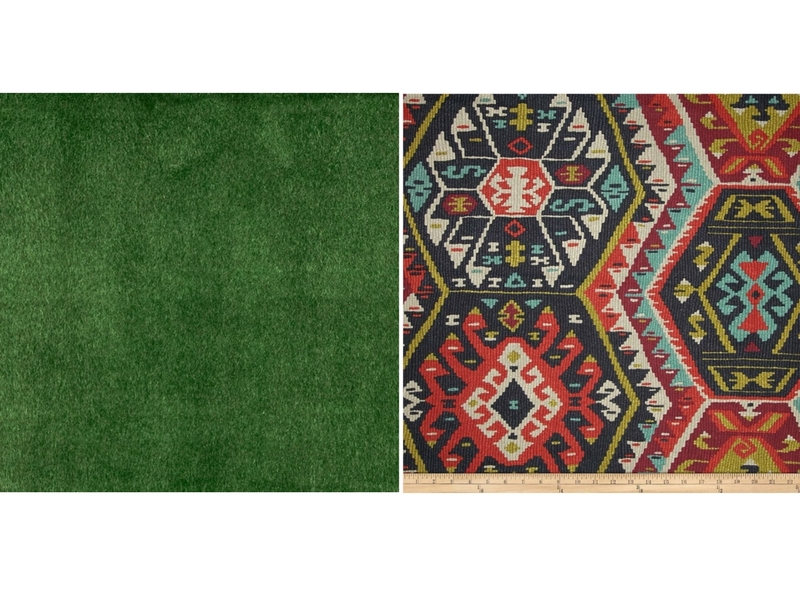 While both are organic looking, it's still the difference between a floral and a geometric. 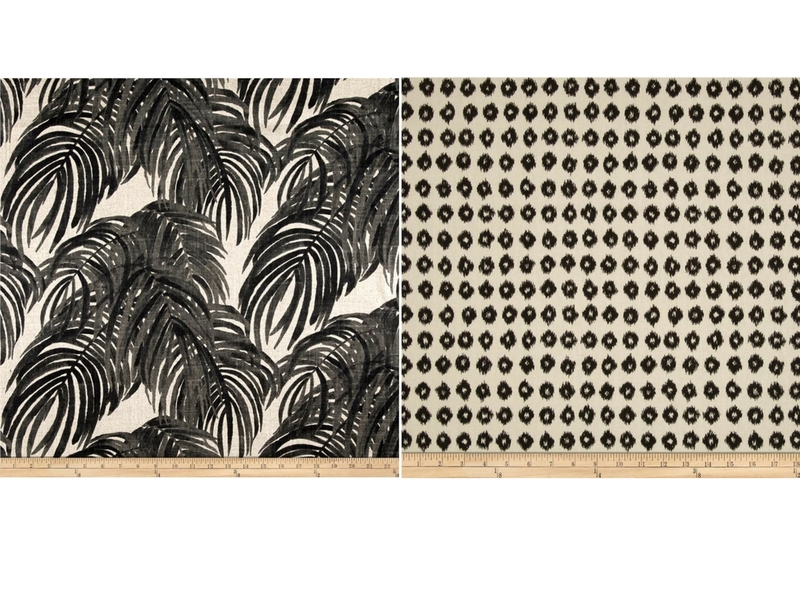 These next 2 fabrics really differ in style. The floral is neutral and almost reminds me of something you'd see in a farm-house style space. The diamond pattern is retro looking in style and color but I think they work so well together. The last one I included because I am using this combo in our living room right now. 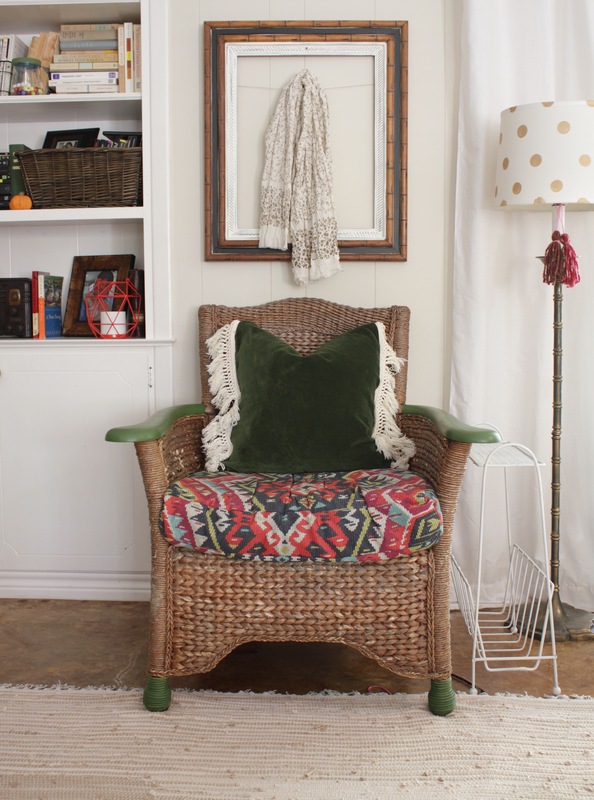 You can't go wrong with a velveteen fabric and this chair was thrifted and has been given new life a few times thanks to a good fabric. I hope mixing fabrics doesn't seem so daunting now. If all else fails, call it 'eclectic'! Pin from below to save or share! Happy mixing!